This months MxMo has been the most challenging thus far and I really like that. Shaun and Christa - of Booze Nerds fame - are hosting and they have chosen Resin as a theme. We thought hard about a theme that would work well for this time of year, and after contemplating the food, booze, and decor we like for the holidays, we settled on “Resin.” From savory rosemary in a stuffing, to a delicious juniper-y gin in a martini, to a fragrant fir ornament or garnish, our friends the evergreens have a lot to offer… The challenge: come up with an ingenious creation using the resin-y ingredient of your choice. Zirbenz, retsina, hoppy IPA, pine-nut puree, even? Sure! Spirit, garnish, aroma, all are fair game. Whatever resin means to you, we want to hear it. I had never heard of Zirbenz and had to look it up - it sound like something I would like, but not readily available in Denmark. Next I considered making vermouth out of a bottle of Retsina and perhaps mix a martini-style cocktail but I could not lay my hands on a decent bottle of that infamous Greek wine, that everybody loves while holidaying on Crete but everybody hates a winters evening in northern Europe. 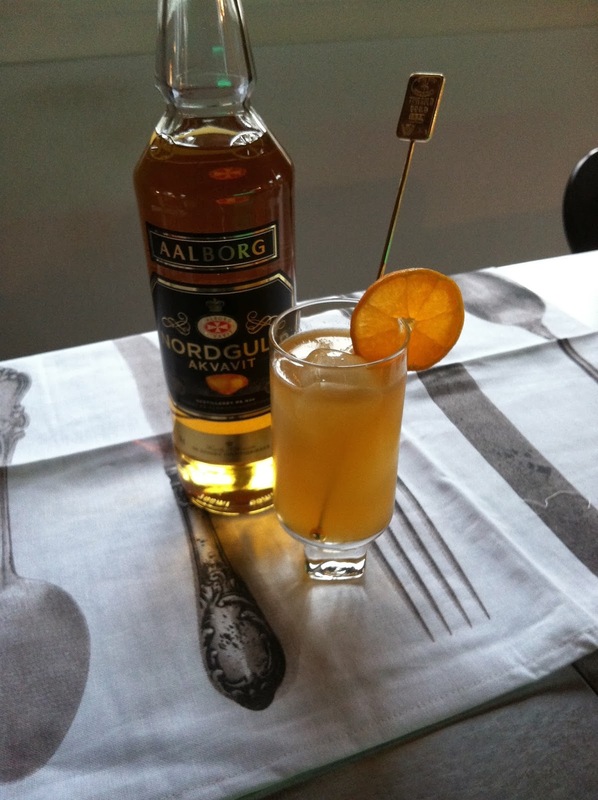 So I settled on something I have always considered overly gimmicky: A bottle of Aalborg Nordguld (means northern gold) - an aquavit made with distilled amber. It certainly has that amber hue, but I'm not completely convince actual amber is involved in the making. However it's a nice mellow aquavit with just that hint of a bite distinguishing it from - say- vodka. Next I jumped at the chance to utilize some of the rosemary still standing proud in my garden and settled on clementine as my base spirit. Shake the first four ingredients with ice. Strain into a highball glass over fresh ice and garnish with a slice of clementine. For the Wray and Nephew infusion - I simply cracked some whole black pepper corns with a pestle and bruised a good sprig of rosemary and stuck that in a small jar with about 10 cl of the rum. The rosemary syrup is simple syrup with a sprig of fresh rosemary added - allowed to steep until the syrup was completely cooled and then strained.